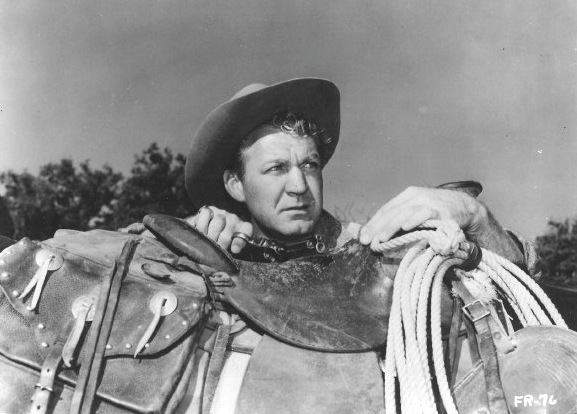 Here is a still of Forrest Tucker from the Regalscope picture The Quiet Gun (1956). One of the better Regals, and one of Tucker’s better parts of his many 50s Westerns. This is a film I have been after for ages and located it on DVD in a most unlikely place. Watched it the other evening and it is a good film – made in wide screen and Black and White with Peter Cushing on brilliant acting form. This was a Hammer Film which came out only weeks before the one that made Hammer a world movie name – The Curse of Frankenstein – so maybe it didn’t get the chance it should have got at the Box Office being overshadowed by that one. Doctor John Rollason played by Peter Cushing, a botanist, is on a Himalayan expedition with his wife Helen, and assistant Peter Fox. But the Lhama is aware – through a mysterious power of mind transference – that a second expedition, led by a ruthless adventurer called Tom Friend played by Forrest Tucker is advancing towards the monastery. Rollason, too, is aware of this expedition – and its mission. He has kept secret from his wife Helen played by Maureen Connell his ambition to join it – and he politely disregards the warning of the Lhama when he tries to dissuade him from linking forces with Friend. Friend’s party arrives. It consists of a tough ex-trapper, Ed Shelley, a Sherpa guide named Kusang and a likeable Scots photographer, McNee. The Lhama confirms that the flask was stolen from the monastery many years ago but Rollason is not satisfied with the gentle monk’s deliberately misleading explanation of the tooth, and is convinced that the Yeti really exist when the Lhama eventually hints at ‘A race of super-intelligent Beings who will take over the world when humanity has destroyed itself’. The five men leave Helen and Fox at the monastery and set out for the high peaks, existing on food and supplies cached by Friend along the same route a year before. They set out with a relief party to rescue Rollason and the others and Helen is overjoyed when she finds her husband is still alive. Wearily they help him back to the monastery and it is here that Rollason shows he understands the mysterious mission of the Yeti – and the need to protect them from civilisation until their time comes to rule the world. In the final frames of the film the Lhama asks Peter Cushings character what evidence he has found of the Yeti and he answers that they have found nothing. Nigel Kneale – above – that great TV and film playwright was responsible for the script and of course he had dome the famous Quatermass TV serials late made into films. I recently visited Herberton just inland of Cairns in Queensland Australia – and there is a wonderful tourist attraction - a village back in the time of the old mining settlement of the town and among the many many attractions such as houses shops, school etc was a display of items of memorabilia of which this one caught my eye, from the 50s or maybe slightly earlier. A Hopalong Cassidy radio set – so this actually may date back to the 40s. It was certainly an early marketing of the famous western star and the promotion of this radio by using his name. Quite clever stuff at the time no doubt. The Arvin Model 441-T or “Hopalong Cassidy” radio, originally priced at $16.95, was manufactured in 1950 using two styles of embossed, paper-backed, aluminum foil fronts. One “Hoppy” front shows his horse Topper rearing with both forelegs in the air, as shown in Figure 1. The other style, shown in Figure 2, has Topper with one foot on the ground and the other in the air. The Topper with two legs in the air version was the earliest design and was ordered by Arvin on February 22, 1950. 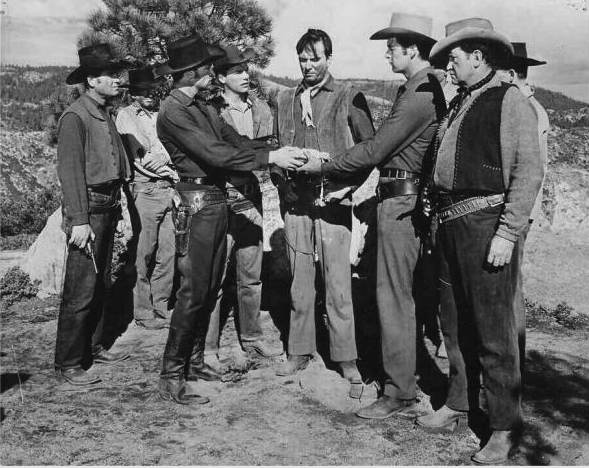 Good cast in this Western – Dale Robertson, Robert Wagner and Rory Calhoun. THE SILVER WHIP. 20th Century-Fox, 1953. 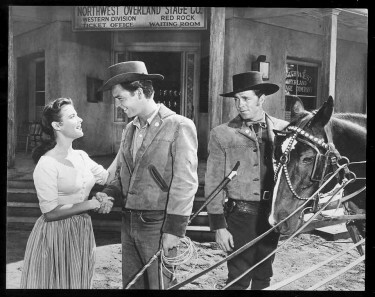 Dale Robertson, Rory Calhoun, Robert Wagner, Kathleen Crowley, James Millican, Lola Albright. Based on the novel First Blood (1953) by Jack Schaefer. Director: Harmon Jones. 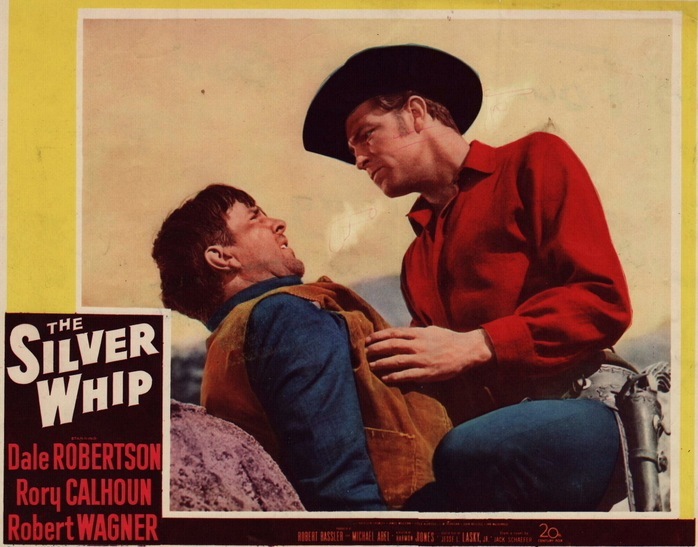 The Silver Whip, an occasionally interesting western with Calhoun as a rough but proper Sheriff, Dale Robertson as his less legal-minded but heroic buddy, and Robert Wagner as the identity-seeking youth torn between the two role models. This is a strong story built around a few key action scenes, given plenty of punch by editor-turned-director Harmon Jones. Race Crim (Robertson) is a stagecoach guard who recommends young driver Jess Harker (Robert Wagner) for his first major run. It goes horribly wrong when Slater (John Kellogg) and his gang shoot up the stage. Sheriff Tom Davisson (Calhoun) and Harker go after the gang, trying to get to them before Race, who’s out for revenge, does. This creates an interesting three-way conflict with both justice (Calhoun and Wagner) and vengeance (Robertson) going after Slater. I won’t go any further than that — this is a good film. 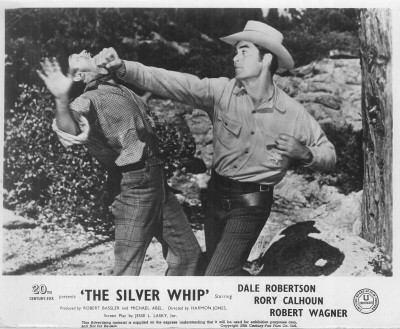 Dale Robertson and Rory Calhoun are terrific but the film belongs to Dale Robertson, whose change from Calhoun’s best friend and Wagner’s mentor to a bitter, obsessed rival gives The Silver Whip a lot of its strength in the last few reels. Robert Wagner seems so young — he was still three years away from The True Story Of Jesse James (1956) – I well remember him in Prince Valiant in Cinemascope – made about a year later. The Silver Whip is out now on DVD.